The mobile app development market is currently witnessing unprecedented growth, most of which can be attributed to the increasing popularity and success of cross-platform apps. More than 80% of the developers believe that cross-platform apps are easier and faster to develop, and is probably the reason why the market for cross-platform apps is estimated to reach USD $7.5 Billion by 2018. As manufacturers and organizations move towards an increasingly mobile future, the appeal for cross-platform apps in only going to grow, as well as the tools and frameworks available which makes cross-platform app development as streamlined as possible. When it comes to cross-platform app development, Xamarin is the undisputed king, owing to its ability to develop to deliver native-like iOS, Android, and Windows apps while using existing codebase, skills, and development languages. Unlike most other cross-platform app development platforms, Xamarin's biggest selling point is that apps developed using it have native like performance, and therefore is not a compromise solution. Xamarin can help build native as well as cross-platform apps on a shared C# codebase, while using the same language, IDE, and APIs everywhere, across mobile platforms. This ensures that the apps developed using Xamarin not only have a native UI and native API access, but are also comparable to native apps when it comes to performance. 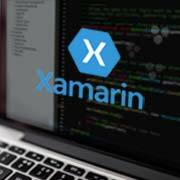 With Microsoft now acquiring Xamarin, it has become easier for developers to work Microsoft Visual studio which integrates Xamarin natively to ensure fully complaint .NET portable class libraries. At O2I, we use Xamarin because our developers not only find it easier to develop and design modern smartphone apps, but also to suitably integrate and test them while using pre-built backend connectors and native user interfaces. Why Use Xamarin Mobile Application Development? Why Choose O2I for Xamarin App Development? At O2I, we are committed to your success by providing not only bespoke mobile app development services, but taking care of the entire mobile app development lifecycle for you. From strategy, to design, development, and sales, we ensure we guide you through every phase of development, while developing an app which can't be distinguished from a native one. Whether your requirement is for iOS, Android, or Windows, our services will ensure significant cost-savings while keeping your customers satisfied. Contact us right away for a zero obligations quote.